The weather yesterday and today is dreadful. Shockingly crap. Pathetically ridiculous. Bleh. But luckily, the bicycle umbrellas bloom! 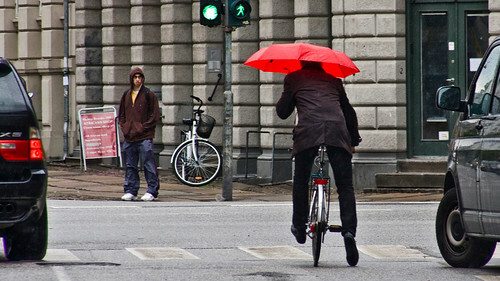 A classic Cycle Chic Launch moment... this time in a suit with a red umbrella. Is there a way to clip the umbrella directly onto the bicycle when it's open? I just bought a huge black umbrella with ruffled edging, and I want to push the eccentric angle to the max once I return to Boston. I haven't had good luck riding in Chicago with an umbrella. My knees still get wet. There's a good article on www.bikepartsplace.com about riding in a city -- how to stay safe, what type of bike to use, best type of handles, etc. Would that umbrella holder work to hold a cane for a disabled cyclist, I wonder? Its like a bubble that fits over your head, fills up with steam and then you crash. Dutch Girl: it would be perfect and brilliant for that. Thank you so much for the Drybike link -- just what the streets of Boston need! And on the seventh day, God invented gortex jackets. ". . .you can break more quickly. . ."
HA! 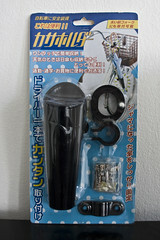 I just saw that umbrella holder in a Japanese store here in Seattle. To bad no one uses umbrella's here. I imagine an umbrella in Seattle would rot, from all the moisture. I once found a stool equiped with an umbrella holder. Was a folding sort of thing, two legs per side, that opened away from a third cane leg, and they awere all adjustable for height and you had a springy arms that you could adjust for angle and tension to hold the umbrella. Too heavy for an effective cane, couldn't walk with it. 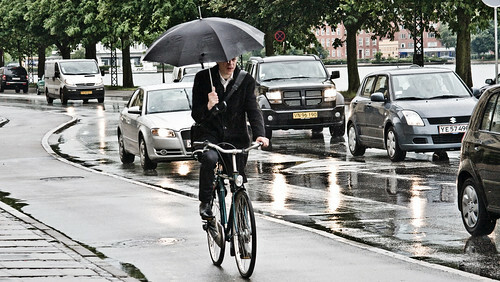 (The umbrella holder seemed to be adaptable to a set of upright handle bars.) I got rid of the stool, kept the umbrella, but eventually decided that it was a cheap umbrella and Disposed of it as well. Still have the cane portion. I eventually found the Swedish 3 legged Aluminum/nylon stool that is rated at 550lbs (Walkstool XL? ), and a padded nylon strap from an M60 Machine gun to carry it over my shoulder. That is VERY convenient. Wish there was a way to adapt the super-big green golf umbrella to the stool. What a timely piece. I was just trying to figure out how to rig my umbrella when it started to rain on Thursday. 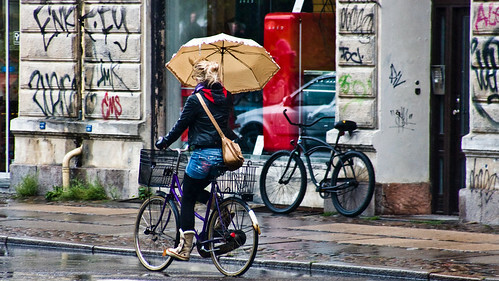 Cycling while holding an umbrella must be a bit tricky! it's not much different than cycling with a hot coffee or a mobile phone. or cycling while you hold onto your bag of groceries on the back rack. I have a coffee cup holder, and find that my umbrella with a curved handle fits perfectly. It will not jump out on bumps because its length.